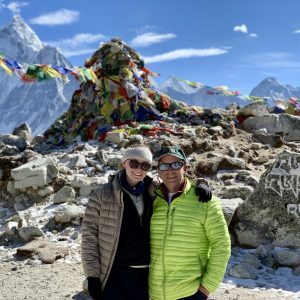 This ancient Sanskrit word already resonates with many of you, but let me just say that after returning from a two week trek, hiking up to Everest Base Camp with my daughter, the sentiment of "the sacred in me recognizes the sacred in you", resonates loudly, like a Buddhist temple bell. Hyperbole aside, I was again reminded of the power of nature, family, love and exercise, and with this new year still fresh, I want to remind all of you of the same. In addition to the marvelous trek leadership and participants, I would also like to draw your attention to two non-profit entities with which I became familiar on trek, The Dzi Foundation, based in Colorado and Kathmandu, Nepal, as well as The Weight We Carry, based in Canada. The dZi Foundation works in partnership with remote communities in Nepal to create lasting improvements in their quality of life. With a full-time staff of almost 20 Nepali nationals working between their headquarters in Kathmandu and the remote communities where their projects take place, dZi currently serves almost 30,000 people in an expanding network of remote villages, focusing primarily on basic infrastructure like school buildings, toilets, drinking water systems and bridges as well as agriculture initiatives. 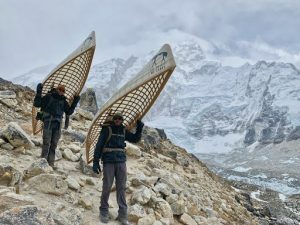 The Weight We Carry was started by two brothers, Tom Shellenberg and Kyle Roberts, who originally hail from Ontario, Canada, and is in support of the mental health of those affected by natural disaster. Subsequent to the devastating earthquakes in Nepal in 2015, The Weight We Carry and KOSHISH are working together to build a Women's Mental Health Transit Centre in Kathmandu, Nepal. At this center Nepalese women suffering from mental illness and other psychological issues will receive Short-term Emergency Care and Professional Mental Health Support. The center will also provide a safe and respectful space for women to recover at their own pace with a general stay of 3 months until they are assisted in reintegration with their family or community.